France, probably Paris, ca. 1270s. Olive morocco by C. Lewis with arms of Henry Gee Barnard outside both covers and inside front cover, lettered: Missale Romanum; in maroon case lettered: Psalterium Davidis - Ms. on vellum executed in Beauvais, ca. 1250. In 1483 was at Riez (Basses-Alpes) according to note on flyleaf; owned ca. 1830 by Henry Gee Barnard; purchased by William Morris from Ellis & Elvey in Dec. 1895 (signature on flyleaf); Richard Bennett (purchased from Morris's estate, 1897); Catalogue of manuscripts and early printed books from the libraries of William Morris, Richard Bennett, Bertram, fourth Earl of Ashburnham, and other sources, no. 20; purchased by J. Pierpont Morgan (1837-1913) with the Bennett Collection in 1902; J.P. Morgan (1867-1943). Ms. psalter; written and illuminated in France, probably Paris, ca. 1270s. 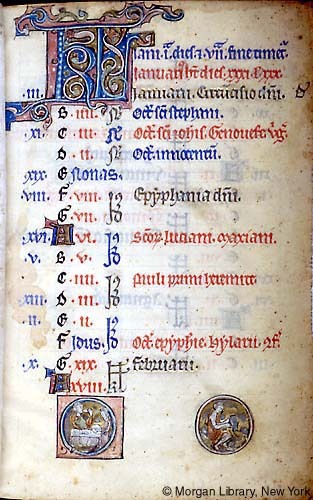 The manuscript was thought to have been produced in Beauvais because there are saints in the calendar and litany peculiar to Beauvais including Dinault, Lucian, Maxentia and Germer (see M.R. James, Catalogue, 1906, no. 20). Decoration: 10 full-page quadripartite miniatures with medallions in the corners, 8 historiated initials on gold grounds, 24 calendar medallions. Artists: attributed by Robert Branner to two 13th-century Paris workshops the Sainte-Chapelle Main Line Group (large miniatures) and the Late Johannes Grusch Atelier (calendar scenes and historiated initials of Psalms), ca. 1255-60. Alison Stones has attributed the Grusch folios to the Hospitaller Master (Maître Hospitalier) and placed the manuscript in the last quarter of the 13th century.